Researchers from City, University of London and Barts and The London School of Medicine and Dentistry have received a £158,111 grant from the Stroke Association to deliver group support for people with aphasia through a virtual island called Eva Park. Aphasia is a language disorder that disrupts the production and comprehension of speech, as well as reading and writing. About one third of stroke survivors acquire aphasia, with profound consequences for the person’s quality of life and social wellbeing. Support groups can help to mitigate these effects, however not everyone can access these and stroke survivors in isolated areas or with mobility problems may be excluded. To help rectify this, a joint project between researchers in the Division of Language and Communication Sciences and the Centre for Human Interaction Design at City aims to find out if support groups can be delivered remotely to people with aphasia through Eva Park. 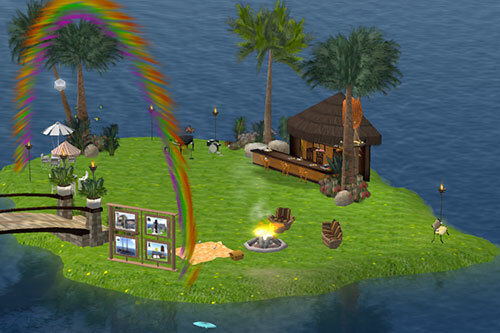 EVA Park is an online island, developed specifically for people with aphasia. It is attractive, fun and easy to use. Those who visit EVA Park are represented by computer avatars and interact using speech or text. During the project users will be able to access Eva Park from their home on a computer. To investigate how EVA Park can deliver group support, in this project volunteers from existing stroke services will provide group support sessions in Eva Park to 32 people with aphasia. Users will also have unlimited independent access. The researchers aim to find out if the intervention is feasible and acceptable, both to those who receive it and deliver it. The impact of EVA support on participants’ mood, quality of life and communication will also be explored via tests conducted before and after intervention. The hope is that the study will assist in the development and documentation of a new model of group support that is of particular relevance to isolated stroke survivors who are unable to access face to face services.